Please let us know what you think, we love your feedback! To leave comments, click here. Download this handy PDF to your painting references file for some great tips on connecting viewers to your paintings through use of colour. Look at the world and figure out what makes you smile. Is it the fizz of the whitewash, the playfulness in the clouds? Is it the grass bending away from the wind? Whatever it is that makes you smile, try and hold that feeling in your head while you paint it. The popular NZ painter gives us a great interview about his process, loves, hobbies and more. The Struggling Artist Struggles On! Our man in the South, Dickie Millott is back with more hilarious insight into his continuing artistic struggles. As mentioned last month, a new V-Log is in the works and coming NEXT MONTH! Remember to register now for your 20% off. Click here to read more and register. 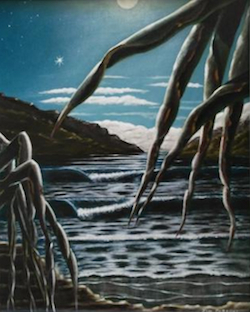 This month we’re focussed on artist Jim, from the Gold Coast, Australia and his moody piece, “Moonlight”. Moonlight is a great example of using colour to invoke mood, and Jim has done a great job with this one! The good people over at the arty factory give us a little more insight into using colour to evoke emotion in your own artwork. Some very interesting reading here if you’re into that kind of thing. Click here to check out some interesting colour theory. This fascinating interview with talented artist Cathy Locke shows how “enabling” her emotion helped to unlock her painting journey. Some really absorbing reading here. Cathy Locke, a wonderful artist and a riveting read. This month’s work comes from a wonderful AA subscriber and fellow water enthusiast, Rheka Khurmi. I moved to Australia in 2014 and stumbled on the explore-acrylic-painting.com website whilst looking for some inspiration. I haven’t painted in years and I just fancied getting back into it, I did a lot of watching of Mark’s videos but still hadn’t picked up the paintbrush. In December 2015 whilst on holiday on Hamilton Island, I signed up to an Art Class with Greg Wardle. It was the first time I’d worked with Acrylics and painted using just a knife, and I loved it. I just needed a little push to pick up the paint again and I’m so glad I did. I wanted to share my latest work with you. I took a photo of this scene looking out from Point Nepean, the most westerly point of Mornington Peninsula, Victoria. In particular I liked the light blues showing in the waves to dark blues, purples, oranges and then greens - it was like a muted rainbow of colours being washed up and that’s what I wanted to capture in the photo. Then I decided I was going to have a go at painting it!! What a daunting task. So first I sketched out the main sections using a pencil. I wanted to just lay down some colour first so started blocking it in. 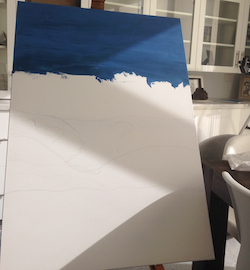 Next I started working on the detail of the foreground - working bottom up from my painting just felt natural. I worked from dark to light to get the depth - making sure any true highlights were left to last. You can see the blocking of the sea with the different colour blues that helped my get some depth when I later added the surf. I had to rework the colour of the rocky area a few times as it wasn’t right. At first I started with a rough approach to give the appearance of rocks, but then found that I liked being detailed and it worked better for me. The rocks under the water were lightly painted on top of the blue to give the appearance of a shallow ledge. 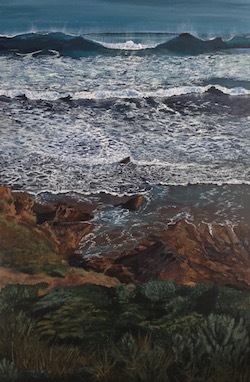 Once I was happy with the shrubs and the rocky area I went to work on the surf which was the important part of making the painting come to life. It was difficult trying to work out a good way to capture so much detail and a combination of a fan brush and then a fine brush to pick out detail worked. I found that I went back to the surf a few times to get the right movement and almost painted over some of the white I’d laid down. That was OK, it’s great to be able to rework and adds to the character of the painting and the relationship I had with it to achieve the final effect. The last thing I did was highlight with pure white on the edge of the surf and add the wind swept wash on the large wave with a fan brush. I also noticed the reflection of the surf edge on the water which again gave a nice depth to the water. Et voila! I was really happy with the colours & motion I’d captured and fell in love with that day. 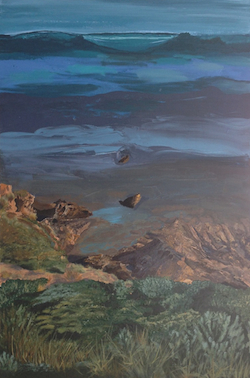 This painting is simply called 'Point Nepean’. Hope you enjoyed this issue of Acrylics Anonymous! If you have any suggestions, comments or feedback for the ezine or our site, please don't hesitate to contact us.